I’m trying to draw more these days. I used to draw way more regularly – I’d keep a comic diary and I really enjoyed doing it. But life gets in the way and I gradually stopped doing it (box sets don’t binge themselves right?). The question I’ve asked myself is how do I force myself to get on with just doing some drawing? Well I’ve started doing a few things that are helping. Firstly, the one thing that I know always gives me a kick up the arse is a deadline, so I’ve been on the lookout for things that require me to write, draw and submit something by a certain date. It’s working too. 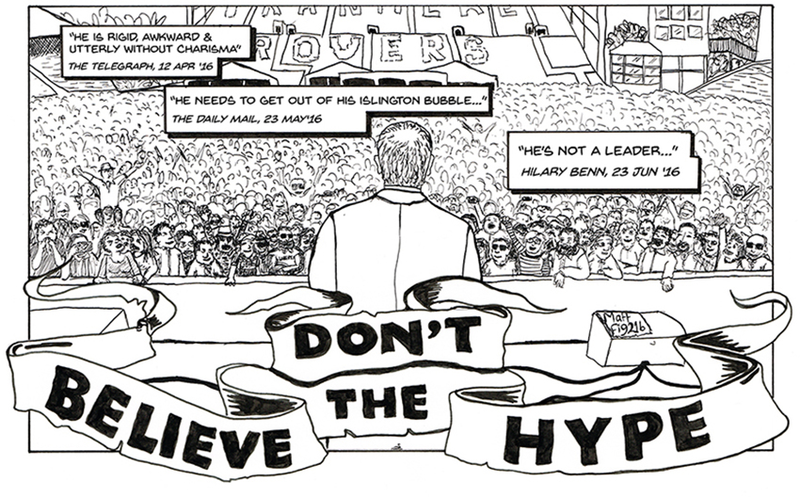 I’ve recently submitted a one-page comic strip to (they didn’t want it – sob sob) be part of a book being published by Self Made Hero about Jeremy Corbyn (the details are here). It was a deadline and I stuck to it. I wrote, pencilled, inked, lettered and re-lettered digitally a full page.